Today our expert guest is LaRae Quy, who was an undercover counterintelligence FBI agent for 24 years. As a former U.S. agent, LaRae speaks and consults on no-nonsense FBI practices that help people develop the mental toughness they need to manage their emotions, behavior, and thinking so they can set themselves up for success. LaRae is also the author of Mental Toughness for Women Leaders and Secrets of a Strong Mind. 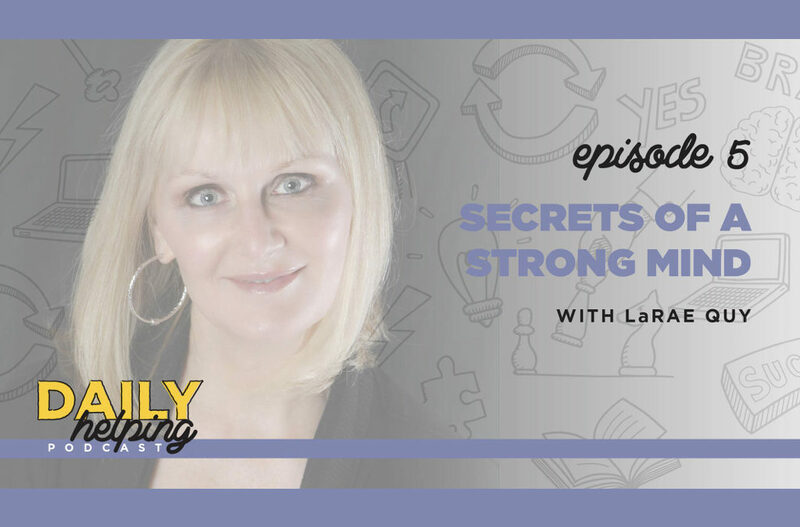 After retiring from the FBI, LaRae started writing Secrets of a Strong Mind. Using her own life experience as an example – from her first pony Socks to Quantico to her time as a spokesperson – she reveals the six core components needed to move through barriers so we can lead our life from a place of personal strength. We all have a story from our past, maybe a failure, that we can use to connect our passion to willpower and keep moving through any obstacle. If you don’t know what that story is, you need to look inward. The most important person you will ever get to know is yourself. You can’t have mental toughness without emotional intelligence – understanding yourself and understanding others; the ability to communicate with others – and emotional competency. Do you understand how you present yourself to people and develop relationships? If you are resilient and you hit a roadblock, you will be confident that you can keep going. To be confident, you need to know how you will respond when you’re faced with the unknown – you can’t simply react or hope you will respond in the correct way. You need the willpower to push past your comfort zone and limits. When times are tough and you’re looking for an answer, are you persistent? Can you set goals that drive you to improve without disheartening you? The toughest people have a champion’s mindset: they can think harder about positive information to counter their bias towards negative information. For every negative thought in your brain, it takes five positive thoughts to counteract it. The biggest obstacles to mental toughness are your own limiting beliefs. Although these beliefs are often seeded by other people, only you can make the beliefs true. Overcoming those beliefs, again, comes back to confidence. Too many people are afraid to revisit their own failures or negative experiences, but that’s how we learn more about ourselves; that’s how we mine the significance of our own stories.